Moss was a two-time All-American in college, catching 174 passes for 3529 yards (20.3 avg.) and 54 touchdowns in just two seasons. However, he had legal problems that had forced his dismissal from Florida State and, while an outstanding talent, fell to the Vikings with the 21st pick in the first round. Big and fast, he became part of a highly productive wide receiving tandem in Minnesota along with Cris Carter. Vikings went 15-1 to finish first in the NFC Central with the conference’s best record while leading the NFL in passing yards (4328), scoring (556 points), and touchdowns (64). Won NFC Divisional playoff over Arizona Cardinals (41-21). Defeated for NFC Championship by Atlanta Falcons (30-27). 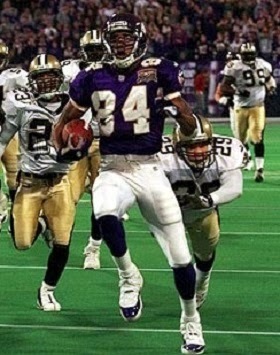 Moss went on to have seven highly productive seasons in Minnesota, going over a thousand yards in six of them (with a high of 1632 in 2003) and reaching a hundred catches twice. He led the NFL in TD receptions again in 2000 (15) and ’03 (17), was a consensus first-team All-NFL selection in both of those years, and was selected to five Pro Bowls. But with all of his tremendous talent, he drew criticism for being a prima donna and a lack of consistent effort. Following an injury-plagued 2004 season, Moss was dealt to the Raiders, where he had two relatively quiet years. Moving on to New England, he was sensational in a 2007 season in which he set a NFL record with 23 TD receptions. He played two more years with the Patriots, again topping the NFL in TD catches with 13 in 2009, but was dealt to the Vikings during the 2010 season and finished up the year in Tennessee. Initially retiring, he returned to play for the 49ers in 2012. Overall, he caught 982 passes for 15,292 yards, which rank third all-time in NFL history, and for a fourth-ranked 157 touchdowns (one TD came on a punt return). He was a consensus first-team All-NFL selection four times and was selected to six Pro Bowls.